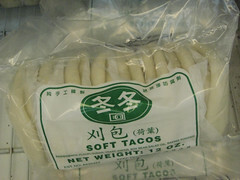 I was amused to see these steamed Chinese buns marketed as “soft tacos” in the Hong Kong supermarket in Flushing, New York City. I’ve encountered several Chinese restaurants in SF that serve mu shu with flour tortillas instead of rice pancakes. I’ve had them in a California-style place (Eric’s Chinese Restaurant), an Americanized place (Mandarin Villa), and a Hong Kong style place (Oriental Seafood). Oriental seafood folds them like rice pancakes, which causes them to split, unfortunately, but it is otherwise a structural improvement over rice pancakes. Whether it is a culinary improvement or a blot on mu shu is a decision best left to the individual eater.